It’s a great reminder to put more focus on the Savior– in our families, with our children and in our own personal role as a parent. Please share some of your thoughts as you study this talk by Sister Lant. I loved this talk as I listened to it in April, I loved reading it again and have looked through my notes from conference over the last few months. I often feel inadequate as a mother, and awed by the responsibility to raise two of our Father in Heaven’s children. I am a perfectionist and tend to be overly critical of myself as a mother things don’t go as planned. I am working on it, I especially love the part where Sister Lant says “The Lord will help us, for He loves these children even more than we do. 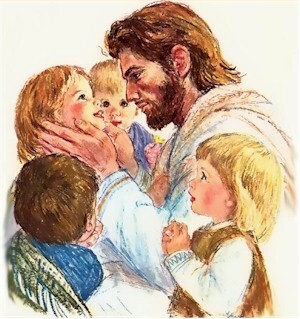 He loves them and He will bless them.” This one phrase has been a great source of comfort to me over the last couple months as I have been praying for the Lord’s help in raising my children. I especially like the part where she mentions that “Christ bid the parents kneel down” after they brought their children to Him. It really stood out to me that if you want to be a good parent, you need to get on your knees, so you can pray for and about your children. Also, getting down on your knees seemed to symbolize to me getting down on their level and trying to understand where they’re are coming from. I just love the simple reminder that so much depends on our example– Not our perfection, but our example of trying to do what’s right and follow the Savior. I’m looking for a print of this art for my children’s room and this site is the only place I could find it online! Do you know the artist or where I could order a copy? I’m sorry, I don’t know. I have it hanging in my child’s room, but I’ve had it since my childhood.